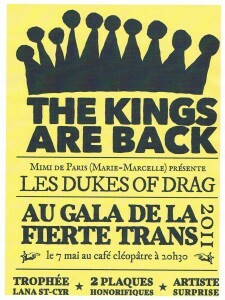 dukesofdrag.ca » Blog Archive » Fierté Trans! Trans Pride Gala! Fierté Trans! Trans Pride Gala! The Dukes are happy to announce their participation at the Trans Pride Gala on Saturday, May 7. We only have love, support and respect for our trans friends and colleagues at the ATQ and will be busting a groove to prove it. $10 -> All monies raised go to the ATQ! This entry was posted on Saturday, April 23rd, 2011 at 1:57 pm	and is filed under Uncategorized. You can follow any responses to this entry through the RSS 2.0 feed. You can leave a response, or trackback from your own site.